June 7th -June 26th. Vernissage June 7th , 7-10p.m. 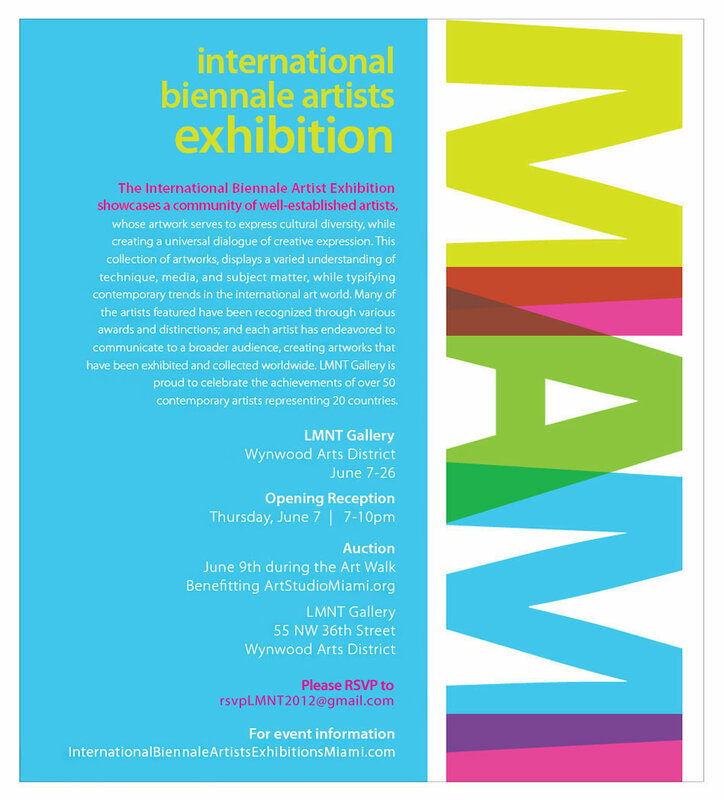 The International Biennale Artists Exhibition will present a display of international contemporary art in a 3-week show that will take place at LMNT Gallery in the Wynwood Arts District from June 7th to 26th, 2012. The opening reception will take place on Thursday June 7th from 7:00-10:00 pm. On Saturday June 9th at 7:00 pm LMNT will host a charity auction benefitting ArtStudioMiami, healing systemic poverty with creative holistic integration for our local youth. For the second time in Miami, the â€œInternational Biennale Artists Exhibitionâ€ will present a display of international contemporary art by emerging and established artists in a 3-week show that will take place at LMNT Gallery in the Wynwood Arts District from June 7th to 26th, 2012. As part of LMNTâ€™s mission to unite artists, art lovers, and passionate collectors who value the contemporary arts as a creative expression of human experience, the â€œInternational Biennale Artists Exhibitionâ€ MIAMI will present an international roster of painters, photographers and sculptors that will exhibit their latest works at the 5,000 square foot Wynwood venue. Founded by Israeli artist Elisha Ben-Yitzhak the â€œInternational Biennale Artistsâ€ is comprised of over 700 international artists, who after participating at worldwide biennales and establishing close friendships, have continued to remain active in exhibitions installments. The â€œInternational Biennale Artists Exhibitionâ€ MIAMI is curated by Dallas-based artist Matt Anzak who will be presenting the latest works by 56 artists from countries such as Argentina, Canada, Chile, China, Colombia, Cuba, Germany, India, Israel, Italy, Mexico, Peru, Poland, New Zealand, Romania, Russia, Spain, Taiwan, Uruguay, the U.S., and Venezuela. en, Ting Huang, and the international multimedia duo, Jaap-Jaapkore. As an exhibition platform, the â€œInternational Biennale Artists Exhibitionâ€ MIAMI will link the LMNT space as an international melting pot where different peoples and styles are mixed together exhibiting a varied and dynamic art collection. On Friday, June 8th, 2012 an educational program will take place at LMNT, a workshop and lecture by Israeli artist Ted Barr. As an innovator of new techniques such as the multi-layered tar painting, Barr carefully controls colors and fluidity creating new textural appearances that captivate viewers. Barrâ€™s favorite motto is â€œAs Above So Belowâ€ meaning that the human body, spirit, society, world and universe are connected as every moon, planet, star, cluster and galaxy are interrelated. Among the highlights for this yearâ€™s International Biennale Artists Exhibition in Miami are American artist Robin Antar- the first female artist to exhibit at NYCâ€™s POP International Galleries; Polish-Canadian bronze sculptor Esther Wertheimer; Peruvian artist Anica Shpilberg; Indian artist Puneeta Mittal and the groupâ€™s founder, Israeli artist Elisha Ben-Yitzhak.